Singapore might be just a little ‘red dot’ on the map, but they have quite a big watch obsession. Last year this sparked a partnership between NOMOS and the Singaporean retailer, The Hour, to successfully release the first edition of the Red Dot — the Glashütte Zürich Weltzeit Singapore. Released in a salmon and white dial versions of their beloved travel watch, it was an instant hit. So this year when the German watchmaker announced the release of their new limited edition ‘Red Dot’ in conjunction with The Hour and Watches of Switzerland — we couldn’t wait to get a closer look. The NOMOS Red Dot is a watch perfect for any occasion and even better when you dress up. Just like the classy and iconic Rolex Datejust, the NOMOS is a dress watch made to be worn to look sharp or in your casual jeans and t-shirt. The NOMOS Glashütte Tangente ‘Red Dot’ 2018 has a little something that made us go wild. Can you spot it? Down there, right at six o’clock, a small red dot sits beneath a matching red second had that spins around its own sub-dial. It’s a discrete addition to the brand’s famous Tangente model — arguably the brand’s signature watch, proudly featuring the best of NOMOS’ vintage-meets-clean-modern aesthetic. But, because this model is so adored, many wouldn’t dare stray from the original unless it was truly special. We think the Red Dot 2018, which is being released in an extremely limited edition of just 100 pieces, is worth ditching tradition for. The NOMOS Red Dot comes in two variants, blue and salmon. You’ll find this slightly-downsized 37.5mm model in both blue and salmon dials — the stainless steel cases distinctively round yet linear and flat on all sides. 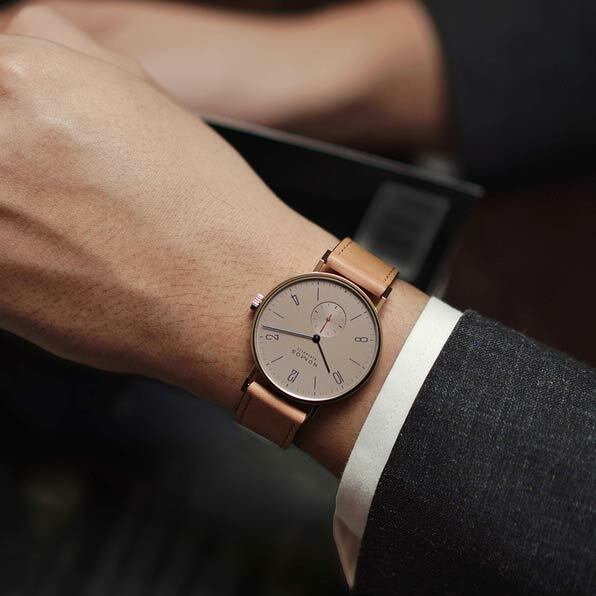 The salmon model features blue-steel hands, matching blue markings, a red second hand and a tan Horween calfskin strap to tie the look together. 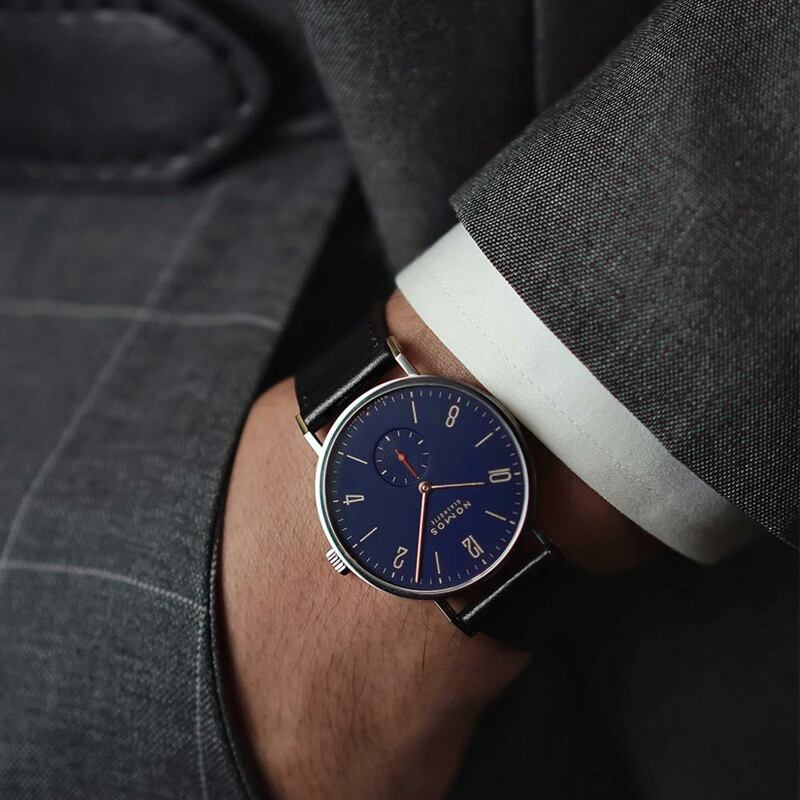 The midnight blue model is essentially the inverse — featuring a distinctive blue dial that’s unique to this edition, as well as rose gold markings and hands. Like the salmon model, it also features a red second hand, but the strap is a Horween shell cordovan in black. 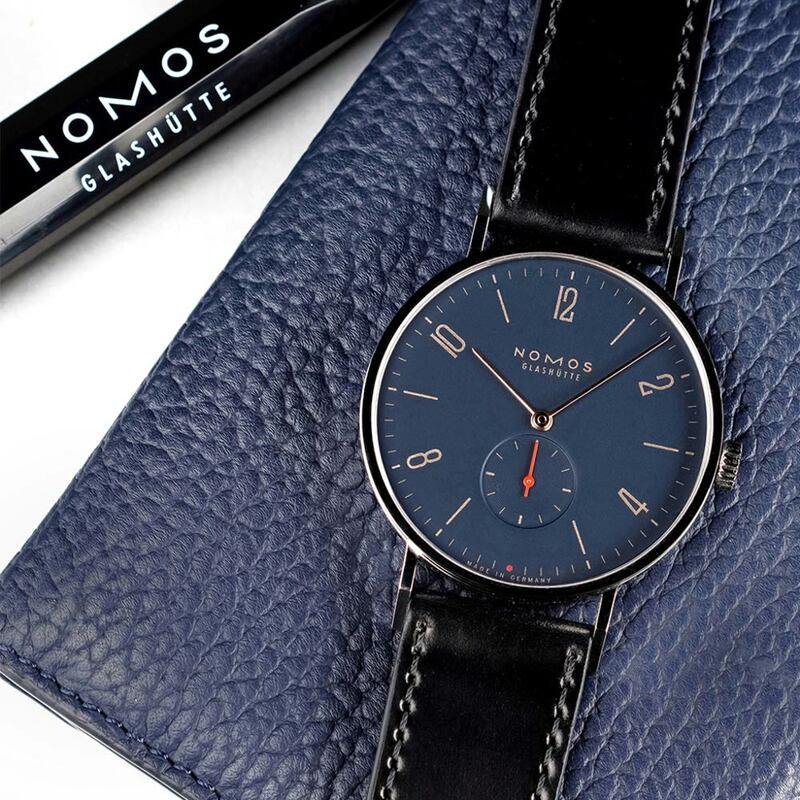 NOMOS tends to keep their watches lighter in color and feel, so the dark, masculine design of the blue Red Dot not only looks great, it feels unique and noteworthy. It is no wonder NOMOS is one of the best in Germany. While NOMOS is highly regarded for its designs — winning accolades like the Chrono Award and the Good Design Award, amongst many others — the Glashütte watch manufacturer outfits their watches with complications that are equally as elegant. Inside the Red Dot 2018 you’ll find a recently-revamped hand-wound Alpha caliber that has 17 jewels, a 43-hour power reserve and a frequency of 21,600 vph. You can watch it tick through the clear sapphire crystal case back — admiring the killer Glashütte ribbing, blued screws, and the three-quarter plate. What do you think of the NOMOS Red Dot? Finally, we have to note one last thing that impresses us about this watch, and that’s the price. NOMOS continues to create modern, well-designed and impeccably crafted watches at a quite affordable price in terms of the luxury watch market. There are few other watches as well crafted, and limited edition, as the NOMOS Glashütte Tangente Red Dot is being sold at $2,340. Now, if you want to get your hands on one of these you’re going to have to go through The Hour, not NOMOS itself. You’ll find both versions of the watch up on their website, but it’d definitely be more fun to pick up your individually-numbered watch person in Singapore — right? Let us know if you take the trip.